Microscope World has a 30-Day Return Policy. If you are not satisfied with your purchase, you may return it within the first 30 days. You must call us first to obtain a return authorization number. Once the product is returned, as long as it arrives in the same new condition it was originally shipped in, as well as with all original packing materials and accessories, you will receive a full refund LESS THE ORIGINAL COST OF SHIPPING and insurance where applicable. Customers must pay their own return shipping fees. For items over $1,500 there may be a restocking fee based on the item, please call for details. Special order parts are not refundable, including many parts required for camera adapters. If returning a microscope please return it in the original packing material. If this is not possible please pack the microscope very well to protect it. Any damage incurred during a return shipment is the responsibility of the customer and will be deducted from the refund. Microscope World carries a variety of brands and products, most of which include a warranty. If a product you purchase should require warranty repair you can either work directly with the manufacturer to get it repaired, or we are happy to help you with this process. 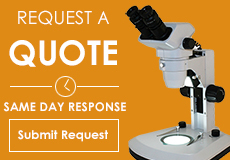 If your product has out-lived its warranty, but still requires repair, we can often provide a quote for repair either from our facility at Microscope World, or at the manufacturer, and help you determine if repair is the most cost-effective option. Below you will find specific warranty information for the brands we carry. National Optical has the following warranties, depending on the product. Throughout this website each National Optical product lists its specific warranty term. 90-Day Limited Warranty - Capture cards & software. 1-Year Limited Warranty - Digital/analog cameras (included built-in), D-EL1, D-EL2. 3-Year Limited Warranty - C Series microscopes. 5-Year Limited Warranty - 100 series, 114-LED, 185, 186-9, 205, 400 series, 405 series, 450 series, DM52, DS2. Lifetime Limited Warrant - 111 series, 130 series, 155 series, 160/165 series, 409 series, 415 series, 420 series, 425 series, 430 series, 446 series, 456 series, 460 series, all digital microscopes except DM52, DS2, D-EL1 and D-EL2. Swift offers several different warranties depending on the product. Throughout this website each Swift product lists its specific warranty term. 90-Day Limited Warranty - Software. Lifetime Limited Warranty - M2250 series, M3500 series, M3600 series, M3700 series, M5 series, M10 series, M15 series, M27LED series, SM100 series, M28Z series, M29TZ series, M2252DGL series, M3600DGL series, M10D series, M10L series. Motic provides a 5-year warranty on all microscopes, a 1-year warranty on cameras and a 90-day warranty on software. 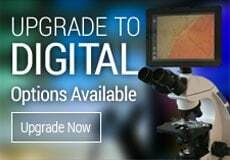 Microscope World provides a 5-year warranty on all microscope system packages. Illuminators and cameras include a 1-year warranty. Warranty does not cover abuse, neglect, improper operation, or normal wear and tear. All Meiji Techno microscopes include a lifetime limited warranty. MEIJI TECHNO's LIMITED LIFETIME WARRANTY is applicable to the United States. This warranty supersedes any other warranty. The Meiji Techno warranty is provided by Meiji Techno (the manufacturer), Microscope World (the dealer) may assist with warranty information, but all warranty repairs will be performed by Meiji Techno in Santa Clara, CA. MEIJI TECHNO's LIMITED LIFETIME WARRANTY is subject to the conditions listed on the Meiji Techno website - view complete Meiji Limited Lifetime Warranty information here. Lumenera warrants that all cameras shall be free from defect from one year. Click here to view the full warranty. Jenoptik's cameras include a 2-year warranty, and the software includes a 1-year warranty. Ken-A-Vision products have a range of warranty times. You can view the entire list here. You can register your Ken-A-Vision product online here.